The "Golden Oldies" Car Classic is almost here! 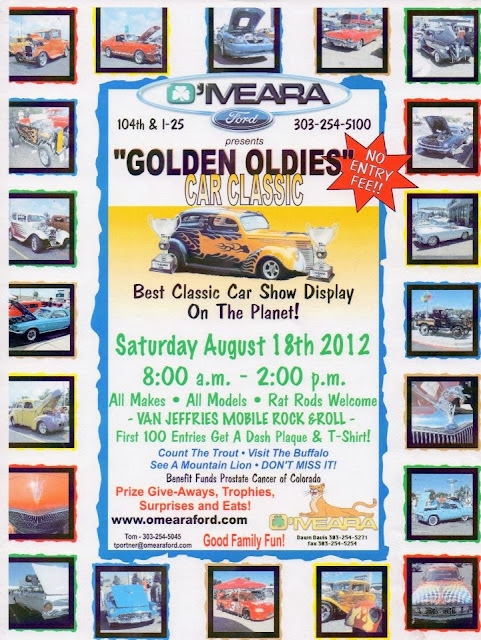 Saturday August 18th, 2012 is the "Golden Oldies" Car Classic here at O'Meara Ford! We will have the show here at the dealership located at 400 W 104th Ave in Northglenn CO from 8:00 a.m. until 2:00 p.m. and everyone is invited! Van Jeffries Mobile Rock and Roll will be on site playing all the oldies! The first 100 entries will get a dash plaque and a t-shirt! Call us now to register your car before it is too late! All makes and all models are welcome! Have a Rat Rod? Bring it to the show! Prostate Cancer of Colorado will benefit from the funds of the show so come out and show your support!